When I first checked out The Reconnection website and other practitioners' sites, the most enjoyable sections for me were always the testimonials and the research reviews. Here are a few comments submitted by my clients which give you some idea of the breadth of healing which you may experience, from pain relief, the disappearance of tumors and other medical conditions to feelings of balance and well-being. You can read more and add your own, including pictures if you like, at the foot of this page. I've also included a recent Reconnective Healing Testimonials video. At first I could feel the eye flickering. I could see and feel energy moving around in a rapid/fast moving way. Then after a while this energy slowed right down and I could feel a lightness/breezy/open type feeling around my thyroid. Then back to the first feeling I described but not as strong. Yesterday I had to go to town and found that I was more talkative and interactive with people I met along the way. And generally finding it easier to be positive. So thanks again. It's interesting that this Reconnective energy seems to come to me in surges like Dr. P describes in Solomon Speaks. Sometimes I can't feel it at all. Then I discovered that if I read from Dr. Pearl’s books, it comes back. Anyway, I'm enjoying experimenting with it. It is a pleasure for me to be able to state that Michael Taylor has on a number of occasions provided me with relief with his technique of Reconnective Healing. When I was in hospital for nine days two years ago recovering from bronchial pneumonia, I was afflicted with a very troublesome cough. Michael came to the hospital to visit me. During his fifty minute treatment, I was relaxed and entirely free of the cough, providing me with important relief. After my discharge from hospital, Michael helped speed my recovery with two more fifty minute sessions. Six months ago I had to have surgery on my right leg to collapse two veins. The ankle after the surgery was very painful. Michael treated it and from that time on I did not experience any more pain. Because Michael and his wife live in an addition to our house, they have been of great help to my wife and myself in a number of caring ways. These have included ten minute sessions of Reconnective Healing with Michael to address the problem I have had with trigeminal neuralgia. The sessions have been relaxing and diminished the symptoms of the neuralgia. Michael is exactly the sort of person who is fully qualified to help any organization that provides care to the elderly. I felt light, my hand felt light; suspended there, it didn’t want to move. I felt it in my elbow then my shoulder on the site of an old injury. I closed my eyes and saw light – white flashes, gold, and magenta. I see it but I’m not seeing it! I haven’t been able to move my arm like this for months! Amazing! These are tears of appreciation. 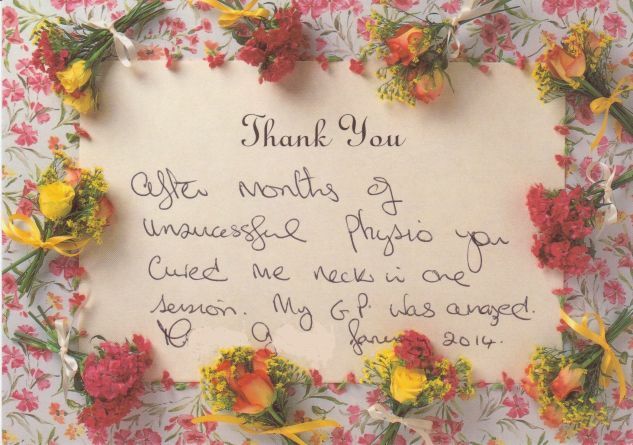 "After months of unsuccessful physio you cured my neck in one session. My GP was amazed." I am able to easily connect with my energy myself now. Good morning Michael, just writing to advise that I wish to cancel my 3rd Healing Session on 1st February...I am pleased to say I am able to easily connect with my energy myself now. The effect is not as dramatic as when I was at your centre, but I feel comfortable with my results and am also able to channel it to any part of my body I wish to. I guess once the door is opened and we believe, all sorts of changes can occur. I really appreciate the time you spent with me showing and explaining this amazing experience. I hope you have ongoing success with other patients like me. I went to see Michael Taylor for Reconnective Healing at a time in my life when emotionally I was not in a great place - my life was at a stand still and I felt that I was going around in circles, unable to make decisions and feeling just lost. Needless to say my health was not very good either. I have now had two healing sessions and although at first I didn't notice any huge changes, within a few weeks I just realised one day that I was definitely feeling clearer about everything, more level headed, and just more settled and happy overall. Everything has just been falling into place in my life of late - it is wonderful. My energy levels have definitely improved too, and emotionally I feel so much more balanced. I am really pleased with how Michael and reconnective healing have helped me - my youngest daughter is soon to do the Reconnective Kids class too - I would not hesitate to recommend Reconnective Healing. - Alison Maclean, Tasmania, June 2012. I appointed Michael to do a [Distance] Reconnective Healing treatment earlier this year. The experience from my perspective was simple, and the results surprisingly positive. I had a stiff neck for a couple of months, and had treatment from a Chiropractor and on going treatment from an Osteopath. After my first treatment from Michael, I was able to discontinue the use of the the Osteopath immediately. I had a follow up treatment a few weeks later, as I had some residual discomfort, that was relieved and has not returned. This was over 6 months ago and the symptoms have not returned. I intend to use Michael's services in the future and do The Reconnection process at a later date. - Garry Scott, Sydney, October 30, 2011. The best thing about being on holidays is that you have time to do all those wonderful things you think about when you are working and busy!! I live in Country Victoria and traveled around Tasmania for 2 weeks with my husband and friend. There was nowhere close to where I live to have "The Reconnection" so I researched the Internet to find out if there was anyone in Tasmania. I was so happy to find Michael Taylor in Hobart. Michael was very obliging and fitted in our appointments with our rough itinerary. My friend had the Reconnection as well. It was much easier doing it while in Tasmania than traveling specifically to have the Reconnection elsewhere in Victoria. I loved the experience as I have been doing energy medicine for many years. I could feel the energy soaring through my body and felt amazing afterwards! I have used Reconnective Healing on my clients of many years and there were many varied experiences and results. I am looking forward to a seminar in August 2012 with Eric Pearl, the founder of Reconnective Healing. Make a contribution to the good of the world by having the Reconnection with Michael. You won't regret it! I first met Michael when he kindly donated the book "The Reconnection" by Dr Eric Pearl to the West Winds library. The book and talking to Michael seemed to make so much sense. The healing sessions with Michael were emotionally and physically calming and gave me the opportunity to feel more positive about myself and my future. My mum couldn't sleep after her 4 hour meeting, so I did some healing on her and she went to sleep. - 9 year old boy the day after his Reconnective Kids Workshop. I just spoke to the young mum of one of my first baby-clients. About a year ago I had one session with a sleeping six-week-old girl with hip dysplasia. Today she said that "the doctors were amazed that she was ready to have the plaster off after just four months instead of the expected six." Now aged 13 months, she's been walking since she was eight months old. "young mom ow you are too kind :) * i am nearly 30 !!! :P ) and yes the doctors double looked; they shook their heads in disbelief when they said her hips were ready to come out of the harness 10 weeks early, they said to me they have never seen hip dysplasia heal so quickly .... * bless*"
Who gets the healing? And when? While doing a session for a lady on Sunday, her husband sat on the couch about two meters away. The moment I started holding my hands over her he commented "I can feel that over here!" I thought he was joking until he answered my question, "What are you noticing?" He gave a beautiful description of the waves of calming energy flowing over him.